Q: What is the Big Red Rewards Program? A: The Big Red Rewards Card Program is our way to give back to our loyal customers. Through the card, customers can receive discounts on items inside as well as get cents off of each gallon at the pump. The more you shop, the more you save! Q: How do I become a Big Red Rewards Member? A: To become a Big Red Rewards Member, simply ask any Big Red employee and they will be happy to help you become a member! It takesno longer than 30 seconds to sign up! Q: How do I use my Big Red Rewards card at the pump? A: To redeem your Big Red Rewards, simply swipe your card before your transaction at the pump. Once your card is read, your rewards saved up will be taken off of your price of gas. 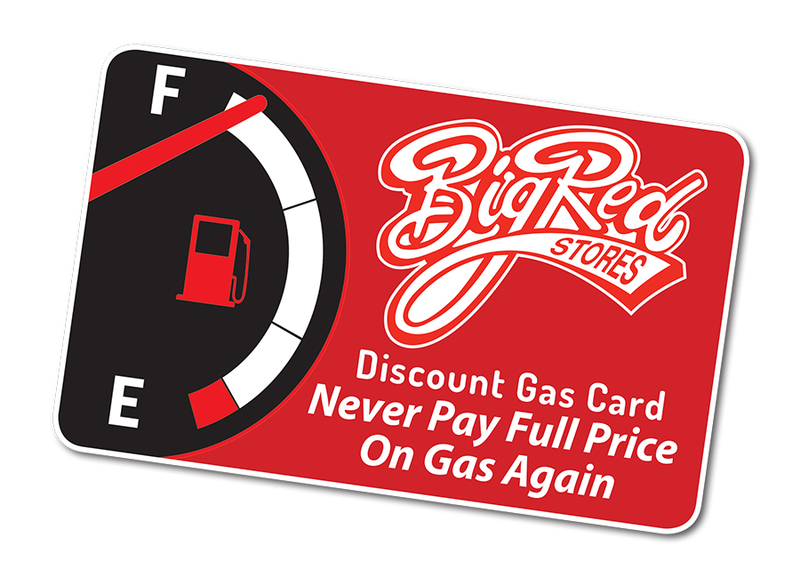 Each customer has an option to ignore the Big Red Rewards option by just swiping your card and paying full price for gas. If paying inside- Hand your card to the clerk. They will swipe the card, then complete the transaction. Q: Whom should I contact if I have a problem with my Big Red Rewards card? A: Any store employee will be happy to assist you in answering questions or solving problems you may have with your Big Red Rewards card. If the clerk cannot help you, the store manager should be able to answer your questions. Q: What if I lose my Big Red Rewards card? At this time, if you lose your Big Red Rewards card, we cannot duplicate your card for you. Fortunately, if you do have a key fob with your card number on it, we can transfer your rewards to a new card with a new card number. If you do not have the card number, sometimes we are able to look your name up in our database and go from there. Cents per gallon off expire at the end of the following month from purchase. For example; if you bought items on November 3rd that you earned rewards on, they would not expire until the end of December.